A fresh option for spring. For 2019, sportswear giant Nike looks to be amping up its Element 55 arsenal having just debuted a fresh new take on the aforementioned silhouette. Instead of a vibrant colorway, as seen on the recent “Midnight Navy” and “Pale Yellow” iterations, this time around the beloved runner gets dressed in a “White/Pure Platinum” palette. The grid-patterned upper is completely done up in white while platinum accents can be found on the leather eyelets, Swoosh branding and heel tabs. Finally an all-white and plug-equipped midsole finishes off the look of this latest React Element model. 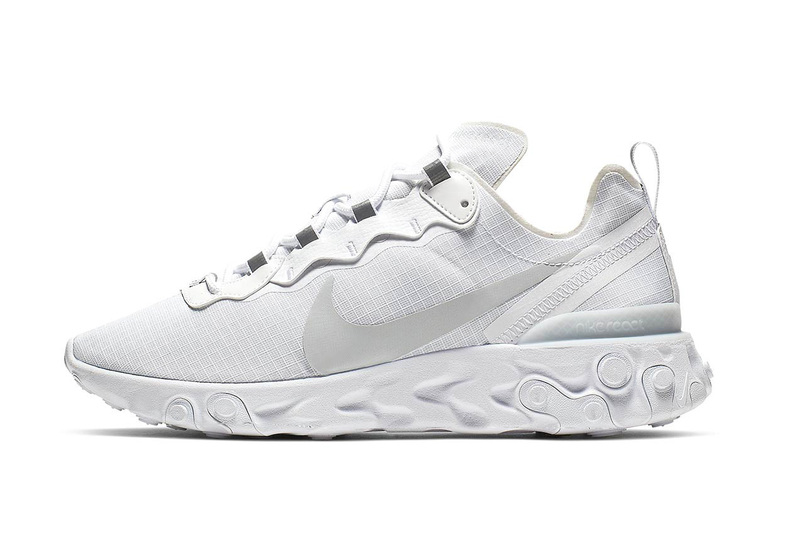 The Nike React Element 55 “White/Pure Platinum” is expected to arrive at select Nike retailers and nike.com in the upcoming weeks for $130 USD. Stay tuned for an official release date. For more sneaker releases, Heron Preston x Nike hits the gridiron in this week’s footwear drops. Nike's React Element 55 Gets Frosty in "Indigo Fog"
A capsule collection spotlighting Ringgold’s iconic ‘The United States of Attica’ artwork. Inspired by Neymar’s “Shhh” tattoo. The young rapper styles himself in his favorite pieces.